23 years of juggling retaliation, The Undertaker and The Triple H have been in action for some major wrestling face offs. Popularly understood as the series of “won the battle, but not the war”, the Dead man and the King of Kings will let their moves clash at Melbourne Cricket Ground in Australia on 6th October. The Attitude Era has yet again made a comeback for the fans and as much as the possibilities of The Triple H winning against Undertaker excite us, the gamble for Undertaker smashing it smooth for the win is the one to watch. 2. Final face off for Shawn Michaels or will he continue by breaking his retirement pact?? HBK’s last fall off opposite The Dead man resulted in his retirement, and he has not competed since. A major first match after the tragic retirement, Shawn will be seen supporting his 20 year old D – Generation X partner, The Triple H against the Undertaker and his so-called brother Kane. The Brothers of Destruction attacked Triple H and Shawn Michaels in WWE RAW, giving a teaser of the much anticipated match. WWE is definitely on with its entertainment factor alongside the crispy rivalry, so the predictions are high for the heartbreaker kid to jump in the fight alongside his mate Triple H.
Shawn Michaels will breathe vengeance in front of The Undertaker who is known to be the reason for Michael’s retirement post the overthrow in WrestleMania 26. Two reasons to get back at The Deadman; one for his dramatic fall back and second for backing up his long time wrestle buddy, The Triple H in the presence of a worldwide audience including over 70,000 watchers in attendance at the wrestling showground. This Six – Man Tag Team match will be another highlight of the evening in Australia. The Shield, comprising of highly talented individuals namely Dean Ambrose, Seth Rollins and Roman Reigns will face off against their immediate counter parts, Braun Strowman, Dolph Ziggler and Drew McIntyre. All six were heavily involved recently at Hell in a Cell and this Super Showdown playground gives them the opportunity to finish what was started during the last Pay Per View Event. It will be interesting to see which team comes on top with one thing common between them…REVENGE! WWE Champion AJ Styles and the contender Samoa Joe’s personal conflict continue to grow DOWN UNDER when they collide at WWE Super Showdown where there must be a winner. 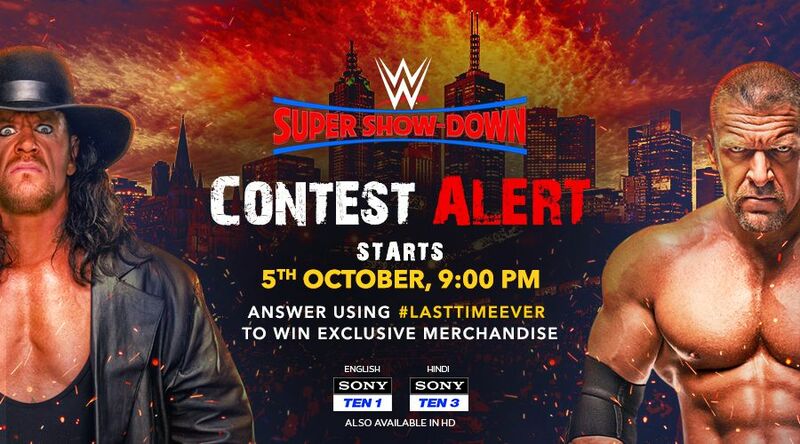 Following a controversial ending to their WWE Championship match at Hell in a Cell, their contest at Super Showdown would be a “No Disqualification, No Count Out” match. Will Styles be able to get the level of revenge on The Samoan Submission Machine after all that Joe has said and done to his family? Or will The Phenomenal One’s anger prove to be pivotal, allowing Joe to strip away not only his composure, but the WWE Championship as well?